An exciting new audio installation at this year’s Norfolk and Norwich Festival proves, once again, that some really creative things are happening at the summer music festivals if you know where to look. The Norwich Festival has built quite a reputation with its audio installations; two years ago I featured Janet Cardiff’s 40 Part Motet which went on to New York's Museum of Modern Art, and last year Helen Ottoway’s Thin Air featured on the path. This year’s installation features the work of contemporary composer Terry Mann whose previous post-minimalist compositions include an interlude for gamelan orchestra written for Joanna MacGregor to play in a concert of John Cage’s prepared piano pieces, and No Ordinary Piano Suite for Prepared Piano. Follow this link to hear samples of Terry Mann’s past work. 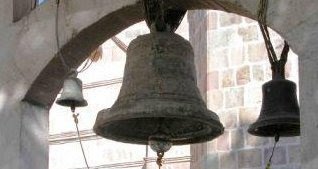 His new commission, The Bells of Paradise, is a complex hour work score for church bells, with seven scored sections linked by intervals of urban ambient sounds. Bells from twenty-two churches and cathedrals in East Anglia and London were used to give a wide range of voices. The recording is made in 5.1 multi-channel format, and was performed in Norwich in the church of St John Maddermarket during the 2007 Norfolk and Norwich Festival. The installation is a joint commission by Norwich and three other festivals at which it will be performed, Spitalfields London, Bury St Edmunds and Lichfield. Terry Mann’s new work is the second electronic composition for church bells in recent years. Jonathan Harvey’s 1980 Mortuos Plango, Vivos Voco was commissioned by the Centre George Pompidou in Paris and created at IRCAM by sampling the sound of the great tenor bell at Winchester Cathedral. Appropriately The Bells of Paradise and Mortuos Plango, Vivos Voco are being performed together on June 16 at a Spitalfields Festival concert in London. Also on the programme, which is a celebration of bells, is Chris Dench's work for solo piano passing bells: night. At the Lichfield concert Bells Of Paradise is being previewed before Philip Glass' opening concert of solo piano music. The Spitalfields concert will be recorded by the BBC for later broadcast, but On An Overgrown Path has scooped Radio 3 for the first opportunity to hear The Bells of Paradise online. Terry Mann has agreed to the complete opening section ‘Birth’ (3’ 18”) being made available on the path, and if your speakers are live you will have heard it, with those gamelan echoes, as you read this post.